Some time ago I was offered samples of 'bacon' bits made from beans, but I ignored the offer, as I often do when companies want me to review their products. Then I read a rave review of the beans on Vegan Eats and Treats, and I had a moment of doubt about my prior decision. So, I looked up the tossed aside email, and wrote back saying I'd be happy to review the bean bacon if it wasn't too late. The sender wrote back saying not only was he sending beans, he was also sending gluten-free ice cream cones, chips and salt. I planned to write back and say only the beans, please, but didn't get around to it. (Not good timing for chips and ice cream cones when I'm trying to eliminate extracted oils and cut way back on sugar and salt.) I forgot all about it until boxes started arriving at my door. I didn't receive any bacon made from beans, but I did get three other boxes, including a box full of Pacific sea salt. The salt comes from New Zealand. "It is harvested from the pristine waters of the great southern oceans. Currents sweep up the Southern East Coast of New Zealand and into the solar salt field at the top of the South Island. The seawater is evaporated by the natural process Of sun and wind for 13 to 22 months. 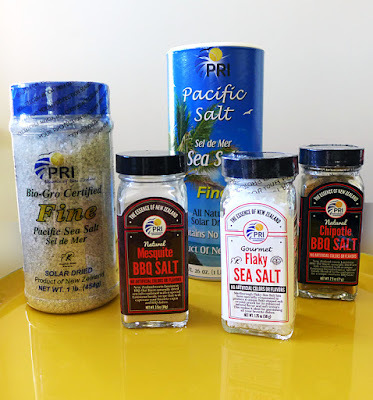 At the end of each summer, Pacific Sea salt is carefully gathered to retain the balance of minerals and trace elements naturally present in sea salt." As you can see in the first photo, I received five samples — all of which I will use. So far I've only sampled the three small bottles, and all three seem excellent. 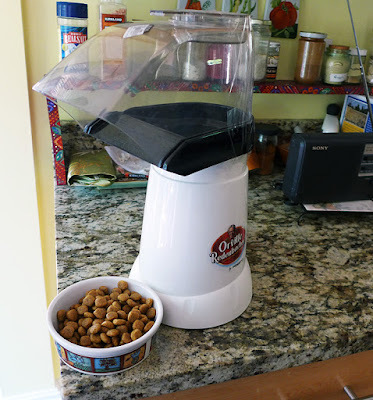 In line with our oil-avoidance, we found at a resale shop, an Orville Redenbacher air popper for $3.00, which seems to be in perfect, like-new condition. The salt arrived just in time to sprinkle on our first batch, and both the barbecue and the mesquite flavors were delicious. 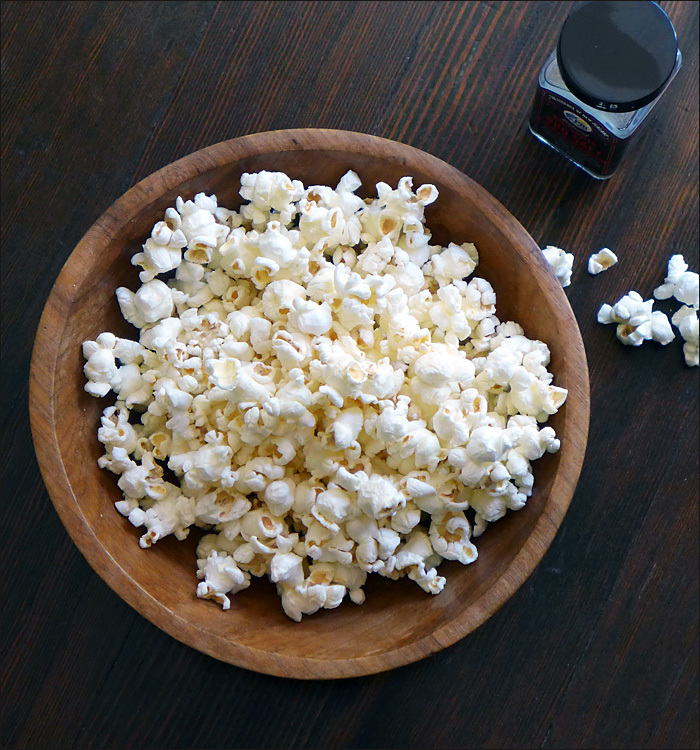 It didn't take very much of the very fine salt to give the popped corn a delectable flavor. The smoky mesquite was my favorite, but the chipotle is excellent, too. 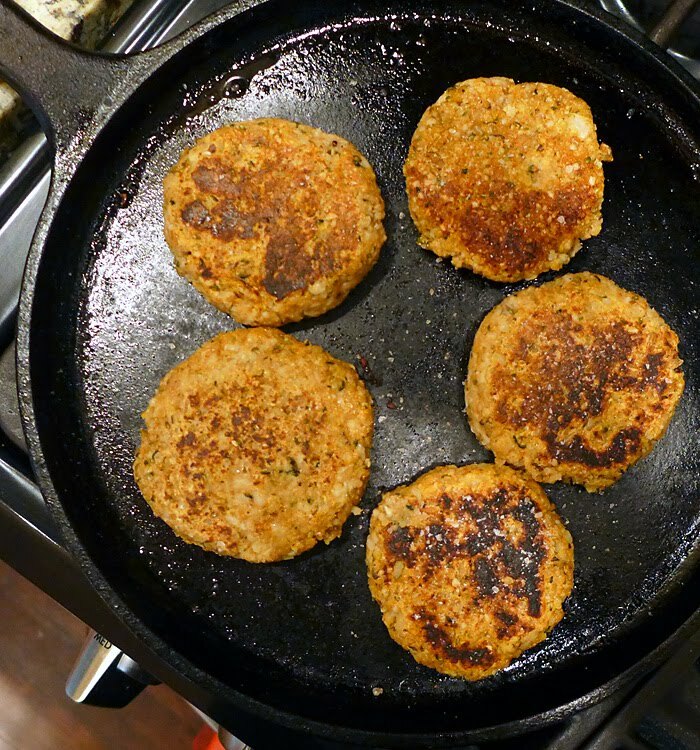 They both will be terrific to use for cooking either on the grill, or on the stove. The third bottle, flake salt, is a gourmet item. The description on the bottle says, "Marlborough Flaky Sea Salt has been specially evaporated to produce a unique flake shaped salt crystal prized for its enhanced natural flavor and soft texture. This makes it ideal for garnishing all your favorite dishes." It does seem to have a richer flavor than plain salt. I'm very pleased with the Pacific salts and am happy to recommend them. In fact, I think I'll have to re-buy the mesquite and the chipotle when they're gone. Have you tried any of the Pacific Sea Salts or other specialty salts? I probably shouldn't be including the photo above since it detracts from the serious intention of my review, but I can't help myself. When I walked into the kitchen, this is what I saw. My husband had set the new popper on the counter next to the dog dish, which hadn't yet been given to the dog. When I saw the two together, I couldn't help but take a photo. It's a pretty special popper, don't you think? I received free product. I wasn't paid. All opinions are my own. I've never been able (or willing) to remove extracted oils from my diet, and, in fact, thought it was kind of overkill, but I'm reconsidering. I know people who have followed Dr. John McDougall's similar no-oil diet for years, and they love it. One of them started following it because she has MS, and she went into remission. I've been making no-oil dishes lately, but I will probably be posting both my experiments with no-added-oil foods as well as the usual choices. Dr. Klaper suggested eating very large salads for lunch and using the slow cooker to make soups that last for a few days. He really does love soup! I followed his lead with a couple of slow-cooker creations. I have to admit when I read a recipe that has tons of ingredients, my interest starts to dwindle. But, when I'm making something up on the fly, adding a load of ingredients seems easy. The soup took about a half hour to prep, using ingredients I had on hand. I steamed the broccoli separately and added it at the end because cooking broccoli in a soup isn't as good-tasting as adding it just before serving. 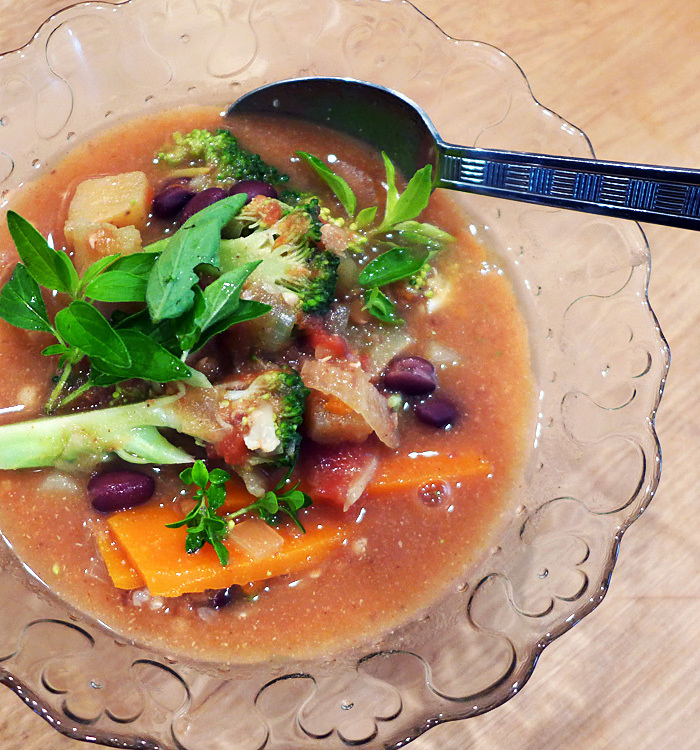 Although the ingredients look pretty basic, the soup surprised me with its rich, delicious flavor. Even my husband, who thought not sauteing the veggies in oil would ruin the taste, loved it. 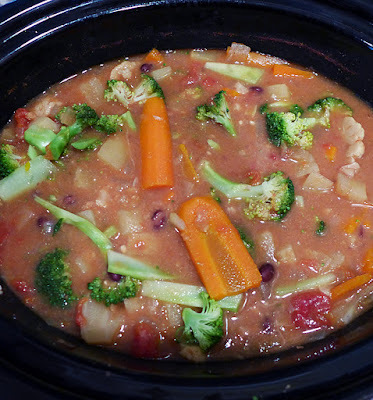 Add the onions, garlic, carrots, cauliflower, potatoes, beans, tomatoes, lentils, yeast flakes, stock and water to a six-quart crock pot. Stir in the chipotle chile powder (or paprika and liquid smoke). Cook on high for four hours, then low for one to two more hours, until veggies are tender. Steam the broccoli and add to the pot. Stir in salt, lemon juice and herbs. We served our soup over a small amount of brown rice. Here is the link to Dr. Klaper's talk, should you wish to listen. There is a brief introduction by one of the PT Meetup organizers, before Dr. Klaper's talk. 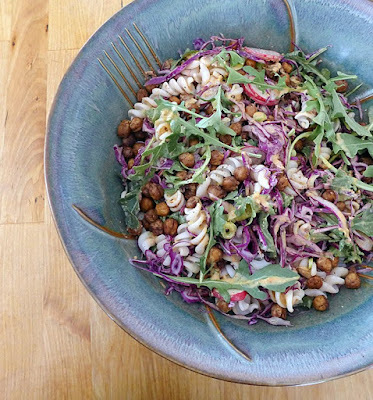 Five-spice chickpea peanut noodle bowl. In my last post — a review of Protein Ninja by Terry Hope Romero — I said I loved one of the recipes so much I was going to re-make it to bring as my contribution to a dinner at a friend's house. Well, I did just that on Saturday, and it was fantastic. I made a couple of changes to make it more of a salad than a bowl, but basically it was the same. 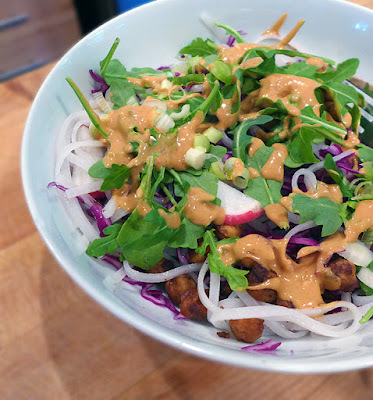 Instead of four to six ounces of long rice noodles, I used about 12 ounces of fusili, I added an extra half can of chickpeas, and possibly there was a bit more shredded cabbage. And I had way too much! After filling my large serving bowl about 1/2 full, I packed the rest away in the refrigerator to use for lunches and dinners! Rather than wait until the last minute to make the salad, I prepared the components in the morning to be assembled before leaving for the party at 4:30. While the chickpeas were roasting, I prepped the veggies, boiled water and cooked the noodles, and made the peanut sauce. I kept the parts separate until it was almost time to leave, then mixed all into a beautiful salad. Such a great dish! On Sunday we took the ferry to Port Townsend to attend a lecture by Dr. Michael Klaper. 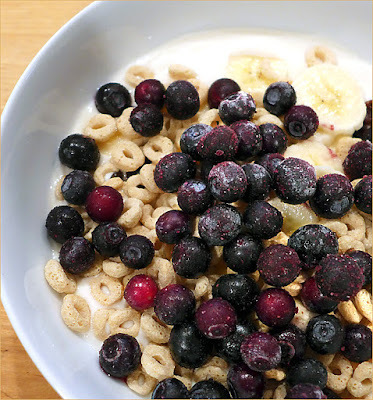 I was inspired to try eating a little differently than usual, and I'll share the foods I've tried (amazingly delicious) in my next post, but I'd better post my saved random eats photos now, just in case Dr. Klaper has a lasting impact on my diet, and my photos no longer reflect my eating style. I suspect things will probably not change much, but you never know. What you are looking at is my modern-day version of a gluten-free (or not) bannock, as might have been consumed during the 1700s in Scotland. (As an Outlander fan, I felt the need to make these one day.) My bannock, in this case, is filled with barbecued tempeh — not very 18th century Scottish, I know. The bannock recipe I concocted appeared on the blog, here. I received a letter from a reader not long ago saying she tried making the bannocks, and the recipe failed, so I immediately got to work making some. I tried the recipe twice, and it worked both times, but so many things can vary with baking ingredients, it's impossible to guarantee perfect results. I should ask my husband to make them, and watch to see if there's anything I can do to make the recipe better. My husband made this, and after tasting one bite I said, "whoa, this is amazing!" Turns out he made ye'atakilt alicha from Teff Love by Kittee Berns. He tricked me by serving it with rice instead of injera. I had just read a blog post by Kittee and had been wishing for Ethiopian food, so it was perfect timing. If you don't own Teff Love, you should go buy it right now. I do love my noodle bowls. 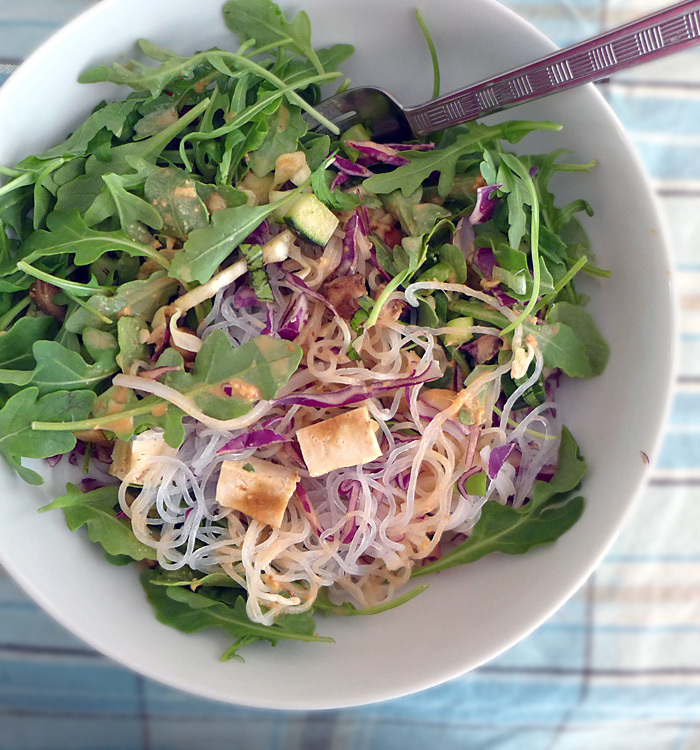 This one has shredded red cabbage, cucumber, arugula, green onion, and microwaved extra firm tofu with Bragg's. I'm getting pretty good at turning leftover stir-fries, stews, or whatever into burgers. These contained a lentil and rice dish (mostly rice and very dry lentils), leftover veggies (I think cauliflower and carrots), hemp seeds, garbanzo flour, herbs and spices, dried onion and garlic, and a bit of water and tomato for processing. Zip zip in the food processor, mold into patties and cook in a pan on the stove top or in the oven. 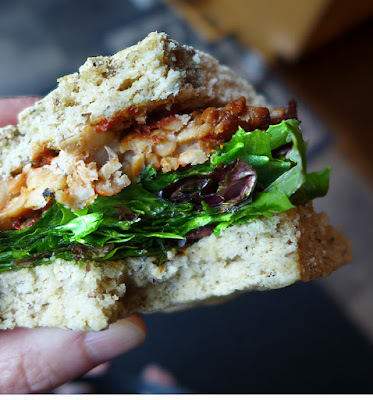 They were great hot for lunch, and the leftover cold ones made delicious sandwiches to take on out ferry trip to Port Townsend. No recipe needed. Do you like to experiment and cook without recipes? Have you had a favorite success? Last but not least, this is one of my typical breakfast bowls, with homemade yogurt, blueberries, o's, hemp seeds and raisins. And there's also a banana buried in there! This post contains Amazon links to books I recommend. 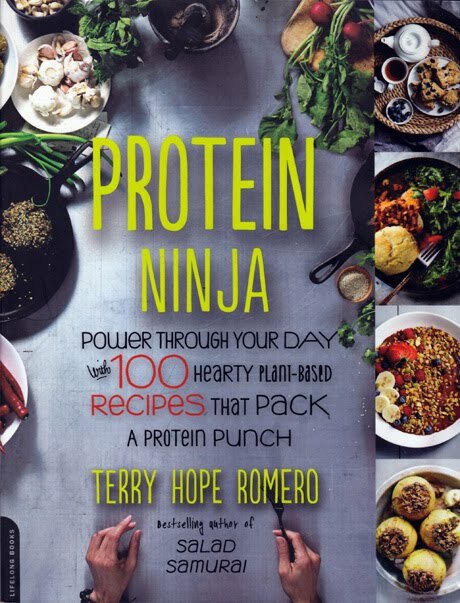 I own and love all of Terry Hope Romero's cookbooks, so I didn't hesitate for a moment when offered her newest, Protein Ninja, to review. I didn't spend much time pondering what the title meant — just casually assumed it was a humorous reference to the "so, where do you get your protein?" question vegans are always fielding. I was wrong. The book is a serious guide for athletes and others trying to add protein to their diets to improve performance and health. Not being much of an athlete myself, I've never worried about my protein intake. 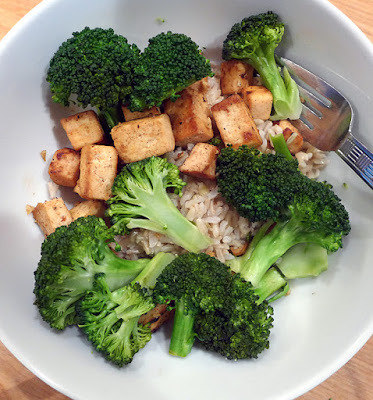 In fact, I prefer to get my protein from foods that naturally contain it, rather than by adding protein powders and such to my food, and while adding protein powders like pea, rice and hemp protein is a theme in the cookbook, there are still plenty of recipes that use beans, tofu, tempeh, seitan, nuts and seeds as protein sources. Those are the recipes of most interest to me, though if you want to add an extra punch of protein to your diet, you will find plenty of delicious ways to do it with Protein Ninja. 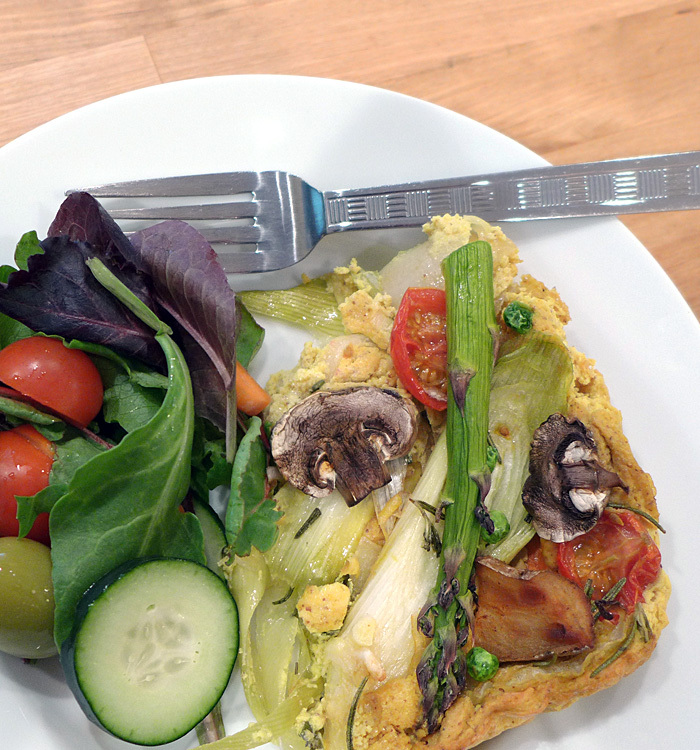 The first recipe I attempted was the baked veggie pan omelet. 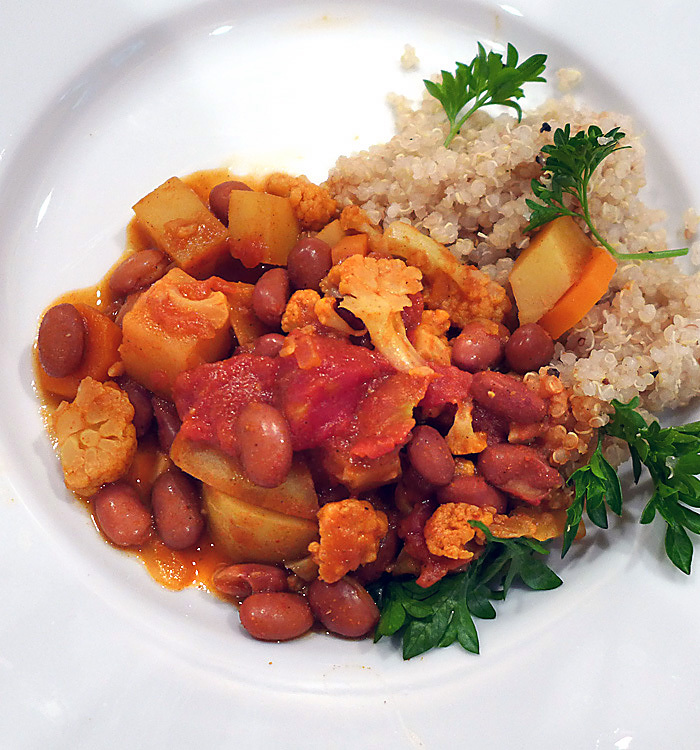 The protein punch came from the tofu plus garbanzo bean flour. I like tofu and garbanzo flour, and the photo in the book was so enticing I couldn't resist. I followed the omelet part of the recipe exactly, though for the roasted vegetable part, I substituted asparagus for green beans and added sprinkle of peas and mushrooms. One thing I noticed was when I followed the quantities in the ingredients list, I had so many veggies I couldn't fit them all on. For example, the recipe called for a pint of cherry tomatoes, but even a half pint was too much, as I was trying to approximate the appearance of the recipe photo. The omelet was pretty, and over the course of several days we ate it all, but it wasn't a favorite of my mine. 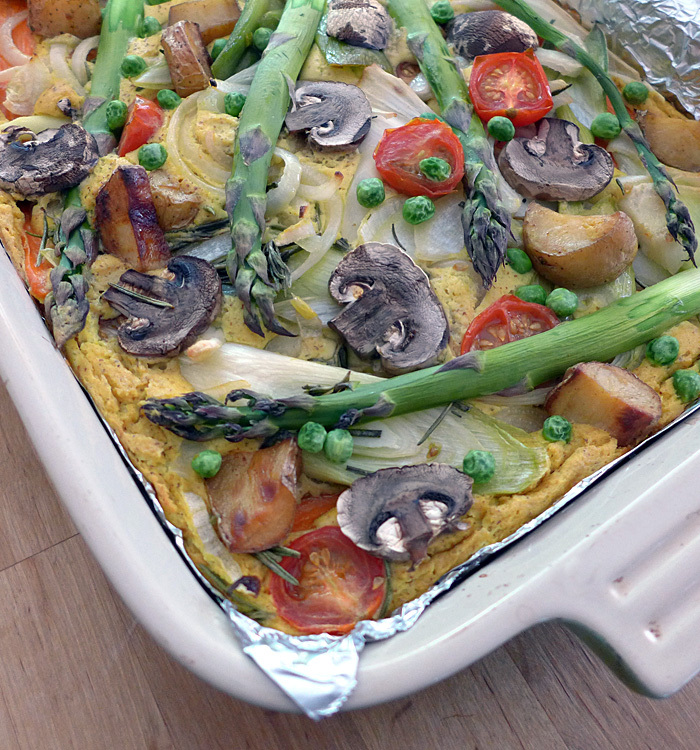 The main reason I didn't love it, though, may be the very reason you do — the texture was too much like a soft, moist (dare I say "wet") omelet of the undercooked style that I remember from before I was vegan. I only ate dry-cooked eggs, the dryer the better, but I might be in the minority there. I baked the omelet much longer than the recipe directions indicated, and still it wouldn't firm up enough for me. Next I was going to make Korean tofu taco salad, but just the kimchi tofu part since I didn't have some of the ingredients for the rest of the recipe. 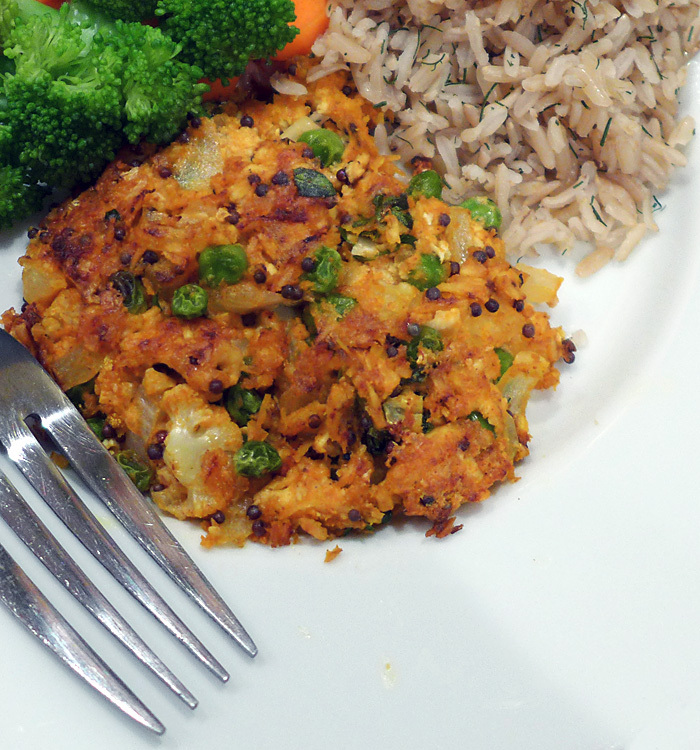 However, the tofu was delicious, and I still intend to make the whole gorgeous dish sometime soon. A good recipe might give you opportunities to borrow and use just one component, and that's okay. Terry's recipes are comprised of various components that you can switch around if you like — lots of potential here. I had to smoosh the patties into shape in order to take a photo. Next up, my husband took a turn trying a recipe. I probably shouldn't even include the recipe for vegetable korma tofu patties in my review, since my husband made an unfortunate mistake, but we can learn from mistakes as well as successes, can we not? First, I want to say that it took him about two hours to get the patties on the table even though the cooking time listed was one hour. (If you think cooking the rice took part of the time, think again. He had a packet of instant rice up his sleeve for that part of the meal.) There are many ingredients and steps in the recipes, and though some cooks may be organized, nimble and quick in the kitchen, my husband is not. Anyway, part way into the cooking marathon, the house was smelling fantastic, and I was getting so hungry, I ventured into the kitchen to see if he needed help, but he sent me away. Too bad. The recipe lists tend to be long, and many continue onto the next page — a fact he didn't notice as he got to work. By the time he realized he needed pea protein powder, he couldn't think what to do, so he left it out. Had he asked, I could have provided him with lots of sample protein packets that I've never used. Needless to say, the patties were not extremely cohesive. He also made too many so they were less substantial than they should have been. The patties tasted good, but not great enough that I would want to make them again, though I'm tempted to see what they would be like if done correctly. 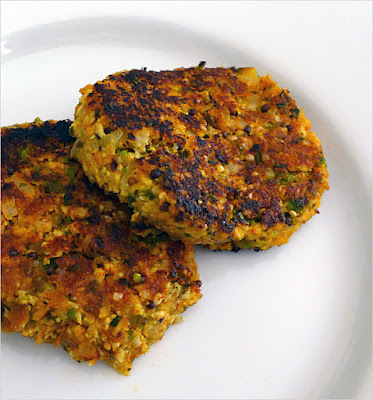 The next day I buzzed the leftovers briefly in the food processor, added some hemp, reformed the patties and cooked them on my griddle. The texture improved, but we were still not overwhelmed. I saved the best for last. 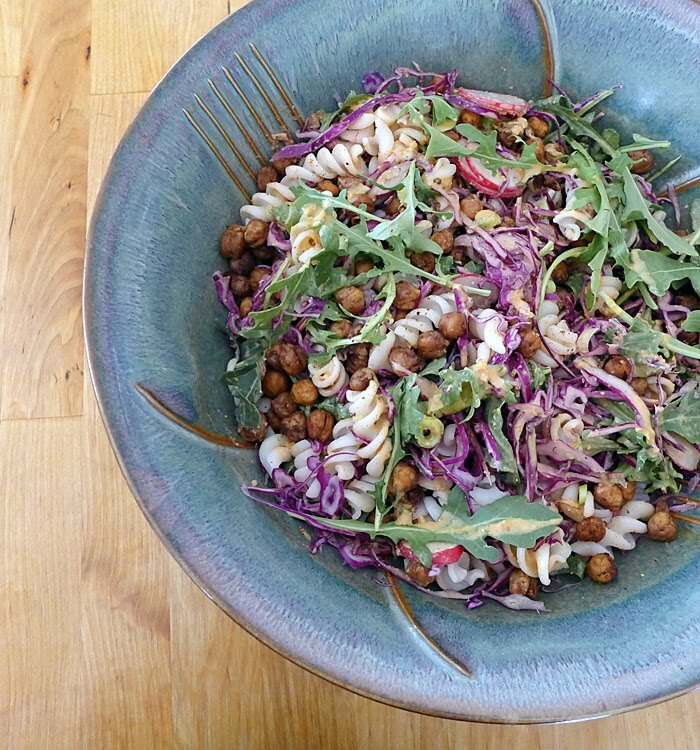 My husband wanted another chance to make something for the review, and he chose five spice chickpea peanut noodle bowl. We both love noodle bowls, and this one was amazing. So amazing, in fact, that I think I'm going to make it for a pot luck next weekend. There was still a long list of ingredients (the peanut sauce alone has nine), and multiple steps (you have to roast the chickpeas, make the sauce and make the noodles and the salad) but the results were worth the effort — noodles, fresh, crispy raw shredded cabbage and radishes, a little bite from arugula, fragrant and deeply flavorful roasted chickpeas, and a spectacular peanut sauce. We both loved it so much — can't wait to have it again. The photos that appear in Protein Ninja are voluptuous, and of course I wish there were more since they add so much to the book. The recipe ingredients and directions are easy to read, though you might need a magnifying glass for the index! Sometimes the directions may be unclear for less experienced cooks. For example, listing whole peeled garlic and a cube of fresh ginger without saying what to do with them before adding to a sauce. If you're on the hunt for stealthy protein additions to your diet, or even if you just want to add clever, intensely flavorful food combinations to spice up your dining, I recommend you take a look at Protein Ninja by Terry Hope Romero. Update: Here's a link to an addition to my review.